IPU New Zealand has a variety of facilities to improve the student experience while on campus. Rather than the large lecture halls found in other tertiary institutes, we hold classes in small classrooms, allowing teachers to focus on and cultivate the growth of individuals in the class. Our picturesque campus also boasts world class facilities for sports, functions and performing arts. 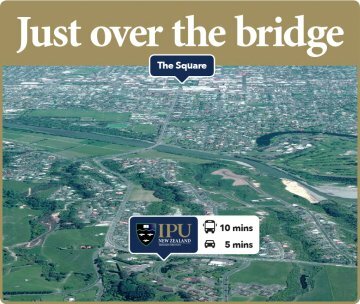 Take a virtual tour of the IPU New Zealand campus with our interactive 3D map or download a campus map.